This last trip was so much fun!! I got there early Thursday with the intention of taking care of some pre-moving appointments (like getting my passport, getting my medical clearance, etc.) but that didn't work out. So the husband and I spent the evening eating Bootleggers pizza and watching TV. He, unfortunately, was unable to stay the night with me because he had a mandatory function bright and early on Friday morning, so he left around 930 and I hit the hay early. Friday was very relaxing, spent being lazy the first half of the day and semi-productive in the afternoon. That night I was finally able to meet one of my husband's friends, and the three of us went out to dinner at this Caribbean place (they had the best fruit punch ever and I'm planning on going there just for the drink when I return this weekend). It was nice to finally put a face to a name I'd been hearing so much about!! After we returned to our room, we immediately went to bed because the next day held so much fun!! We had a great time and were completely exhausted by the end of the day!! So, we drove home and took a little nap. We enjoyed a nice, homemade dinner, and some Skyrim time. Sunday didn't start out so well. As most of you military SOs are aware, you can only book on-base lodging for three days at a time. On the day of checkout, you have to call early in the morning to see if you're able to secure extra days. If you can't stay, you gotta checkout by 11 and hope that some place nearby can take you in (of course at triple the price of base stay)! When I awoke Sunday morning to extend for another day, I was told there wasn't anything available - great thing to wake up to at 5am, right? The lady said to call before checkout to see if things had changed, but to be prepared to have to leave. So I got up, made my love an amazing breakfast, and we just laid in bed together hoping we could find some other place to hang out. We decided that if I was unable to stay on base, I was just going to leave early because it was so much more expensive any other way and we could save that cash for another trip. I prepared a picnic lunch for us to enjoy after I had to checkout and we were good to go. BUT it was all in vain because when I called at 1030, I was able to secure another night!! It was great news and my husband was so happy we would get to spend even 10 more hours together (I could see the relief all over his face)! Anywho - we enjoyed every minute of our time together just like we do every time we're together. We try our hardest not to waste our precious moments because who knows when he can be taken away where he's not just a car drive away? We are still working towards getting everything taken care of for our PCS to Italy. I've gotten the pooch chipped and re-vaccinated (all we have to is get her "certified" by a USDA vet and buy her a shipping crate and a "plane ticket" for cargo shipment). I have to get my passport and visa done when I visit this weekend and my hubby has to get a "level 3" tooth pulled this week. Unfortunately, because of the necessary oral surgery, his return home for his leave will be pushed back for at least a week and possibly up to another month :( BUT these things happen and I better learn to live with things changing without any notice at the drop of a hat. It could be so much worse and I'm thankful that he's safe and sound and in the states! This only makes me that much more excited to see him this weekend (and see him graduate from tech school next week!!!!!!) and get our lives started in a new country, hell a new continent! There are moments when I'm sitting in this cold, empty house, curled up under a blanket and staring at these walls covered with so many memories, and I'm suddenly struck with this... feeling. I can never put a name or explanation to the way it creeps over me and squeezes my insides - anxiety, anticipation, hope, desire - I can never quite articulate what it is, this driving emotion, but it makes me long. Long for you, for your closeness, your comfort, your touch. Long for that moment when I feel like this weight has been lifted off of me and I know that you're only a breath, a stretch, a turn of the head away. It makes me want to let tears stream down my face and sobs escape trembling lips. It makes me want to jump in my car and go to where you are, where I can feel you and see you in the flesh. It makes me feel uneasy; knowing you have this sort of involuntary control over me. It makes me feel complete; knowing that I have someone, that I have you, this man whom I love and desire so dearly that my body literally doesn't know how to function without you near me. And then the time finally comes where I do get to see you, touch you, smell you, and it feels as if I am finally reentering my own skin again. It's as if I had been disconnected from everything, shutting myself off until I could once again experience the world with you right by my side. The feeling disappears. The uneasiness, the tension, the distress, the internal struggle - it all just melts away. Knowing how it feels to simply be separated from you for short periods of time make me absolutely dread the day when I must endure life without you for longer intervals. Knowing how it feels to simply be separated from you momentarily makes me shudder with unadulterated fear at what life would be like without you, period. Call me dependent, say I'm helpless and clingy, whisper that I can't survive on my own, and honestly, I don't care. I'd rather be called those things than live my life without you in it every moment of every day. I loathe the time we spend apart and anticipate with every fiber of my being, every hair on my body, every single cell within me the next time I'll get to feel your breath ripple across my skin, encounter the brush of your skin against my own, get to embrace your body against mine. I live for the moments when it's just us two, sharing the same space, hearing the same noises, smelling the same air, simply being in the same place and time. I've found the man whom I love more and more everyday, and I just want to live out our lives together. It's as simple as that. I've found you, I get to keep you, and I want to be with you. Is that too much to ask? This trip was a little different than last time. First, I was entirely alone on the ride, no dog to accompany me because they had no housing available to accommodate her. So I got stuck on the fifth floor of one of the dorm/hotel buildings housing a lot of the single airmen stationed on base, and let me tell you, those walls are paper, freaking thin!! Although the signs all over the place said "Quiet Zone - Airmen Living Space," it was a flat out lie - quiet zone my hiney! Second, and most importantly, the hubs was on ATP which meant... overnighters!! The inconsiderate neighbors didn't matter, because I was with my husband and I enjoyed every, single second with him! Not a thing could ruin our time together, especially because he was mine from 4pm Thursday night until 10pm Sunday night - and I mean EVERY SINGLE SECOND! I got to sleep an entire night, in the same bed as my husband, for the first time in eighty-seven nights - and it happened three nights in a row! Now I'm not sure how many of you have ever had to endure this. Having been with someone, sleeping beside them pretty much every night for almost six years out of the eight you've been together, adjusting to how they move, twitch, contort, while they slumber, getting used to the sounds they make during REM, loving how his body is your own personal heater that offsets your naturally chilly toes... that becomes the norm. You discover without that form pressed against yours, those arms encircling your torso, it becomes difficult to fall asleep, and if you are lucky enough to catch some dreamless rest, you certainly aren't refreshed when you awaken from it. I've had to endure that never-satisfying snooze, the endless yawning, always groggy, constantly-seeking-rest state for the past three months... until last weekend. And even if I only did get three days of amazing, blissful, fulfilling repose, it was quite possibly the thing I've been most looking forward to returning to normal. But it wasn't so much the sleep that I'd even been missing. More simply, it was the routine. I missed starting and ending my day with only him in my vision. I missed the sharing that occurs between the embrace of fluffy, down-feather pillows and clean, comfy, cotton sheets. I missed the love that radiates from a simple brush of his skin, a whispered 'I love you', or a good-morning kiss. I missed the giggles and smiles that fill a dark room when neither of us want to close our eyes because we'll no longer be looking at one another. And although I was only allowed a small sample of what I'd been missing out on, what I'd desperately been aching for, it was enough to get me through until the next time I'm with him. But enough sappy, young-love nonsense :) - the weekend was otherwise very nice, relaxing, and quite simply put - perfect for us. Allow me to preface the remaining lines by saying, a lot of our time was either spent in bed or eating, so prepare yourself :) We had a late dinner on Thursday night at this placed called "Snapper" something or other. My love had seafood, big surprise there, and I was delighted with a lovely rib-eye, as fish is so not in my scope of what I find appetizing. Friday we slept in late (for us anyway) getting up around 9am! 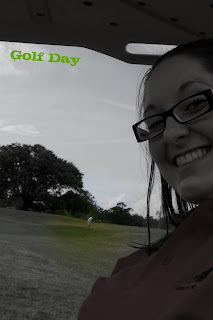 We had lunch on base and followed it up with a little golf. I was an expert score-keeper and golf cart driver, escorting the actual golfer around a very confusing and apparently easy course (the pro got a birdie on a par 4!!). Around the fifth hole, he ended up joining the pair of guys playing in front of us to make it a bit more interesting and a tad more social. I had a blast, especially because it wasn't 1000 degrees, and he got to play golf for the first time since November! After golfing, we found a hole-in-the-wall pizza place called "Bootleggers" with the best Chicago-style pizza I've ever had outside of Chicago! We watched the Orlando/Dallas game while we gorged on tasty slices and got back to the room and into bed on the late side. Saturday was much lazier, and we even slept in a little later - like 10!! We had lunch in the room and watched episodes of Psych that I brought with me (our favorite show!) I read while the hubby played some Skyrim and when he fell asleep for his "afternoon nap" (he's such an old man!) I took over and played a little. Then we went out to a nice little restaurant called Jazzeppi's, a jazz-inspired Italian restaurant, which turned out to be jazz-less, uninspired, overpriced, and kinda crappy - ya live and ya learn. So instead of ending the night on a low note, we decided to go to the pier and enjoy the amazing sunset and the fantastic breeze, deciding afterwards to get some tasty good ice cream on base. Sunday we contemplated driving to New Orleans for the day, but since he had a curfew and we didn't want to risk anything, we decided to push that trip off until next time I visited him. Instead, we had movie day and lazy day number 2, ending it all with a hot, steamy bowl (well 2 for my love and leftovers for him and his roommate) of homemade chili that I was crafty enough to prepare in a hotel room with my handy-dandy crock pot. I dropped him off at his dorm around 9 because he had some laundry and some studying to do before PT and his classes on Monday. It was a much harder goodbye than the last time, and I found myself getting all crybaby on the lonely ride back to my hotel room. I read myself to sleep and headed back home bright and early on Monday morning.